This is a poem written by Caralyn Wittal its called “changing over time”. In this poem she talks about how when you are younger you could be scared of whats to come and you may be chased by your parents to get good grades but in the end, you will realize that life is more messed up then you first anticipated. The poem says “tough as nails” this is a metaphor, in the poem “tough as nails” means we grow up and become more resilient to people. When you’re older you care about the little things as much as you did when you were younger. 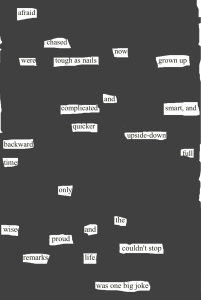 This poem is a free verse poem about growing up. When the poem says “was one big joke” it’s referring to looking back to when you were younger and all you cared about was the stuff that didn’t really matter when your older you can hopefully look back and laugh about it. Thanks Caralyn – I like your poem; however, your rationale does not state where you ‘found’ the poem, or what literature inspired it.